It’s been a week since we went travelling with baby to Gran Canaria and although we’ve been back a week, I’m still not through the washing pile!! So, while I wait for the next load of washing to finish I thought I’d evoke that last minute packing feeling (yes, I am the kind of person who packs at 9pm the night before leaving for holiday) and tell you all what I packed, what I didn’t need and what I wished I’d taken! In case you haven’t been keeping abreast of our family trips (you are forgiven), here are the details so you know whether to cut the amount for shorter trips or double it for longer (it’s a bit like a recipe! ), or increase/decrease the clothing layers. 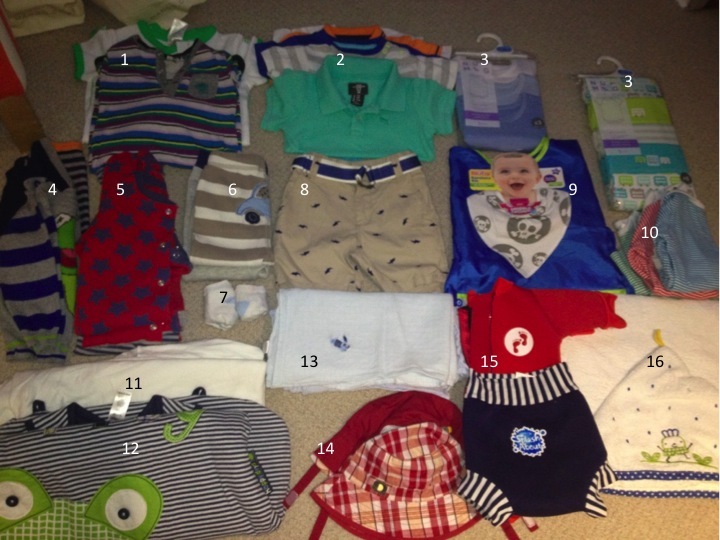 vests – 3 sleeveless, 5 short sleeve – all 9-12 months so they wouldn’t cling if it was hot – he slept in these every night. 3 sleep suits – it was too hot for these but he did wear one on the way home. 2 tracksuit type bottoms – very useful for popping on with a vest when it was getting a bit cooler, I wish we had taken more. socks – I always have lots of these, we didn’t really need them! shorts – the shark shorts were not comfy enough for regular use but he looked cute in them! The other shorts were 0-3months and comfy, so we did use them with a vest! 2 bibs – 1 was a bandana bib in case he suddenly started teething, the other a wipeable bib for dinnertime. 3 long sleeve vests – we didn’t use them all but it was useful for evening times. 1.5 tog sleeping bag – I’m sooooo glad we took this. He slept in it every night and also wore it at night when we were watching the entertainment with Gabriella (he would fall asleep on his dad during this!). I also took a normal sleeping bag but we didn’t use this. 2 sun hats – Essential!! If you’ve seen the swimming post, you’ll know he even wore these in the pool and underwater! wetsuit and swimming shorts – we only used the wetsuit, as I was paranoid about him getting burnt! When he was in the shade in the dingy that we got there, he just went in swimming nappies or his birthday suit. towel – I thought maybe we should have taken 2 but 1 was fine for using by the pool. There were towels in the hotel room that we used after bath time. jacket and 2 blankets – not on the picture. We also took a jacket (it was only used to get him to the airport at 5am) and 2 blankets, which were really handy for covering over the buggy during nap time (I’m not sure if it helped him stay asleep longer but I like to think it did!). The ‘other things’ required a suitcase to themselves! This is everything from nappies to nail clippers. Buggy and Rain-cover – we didn’t need the rain cover, as it didn’t rain. But it might have done! 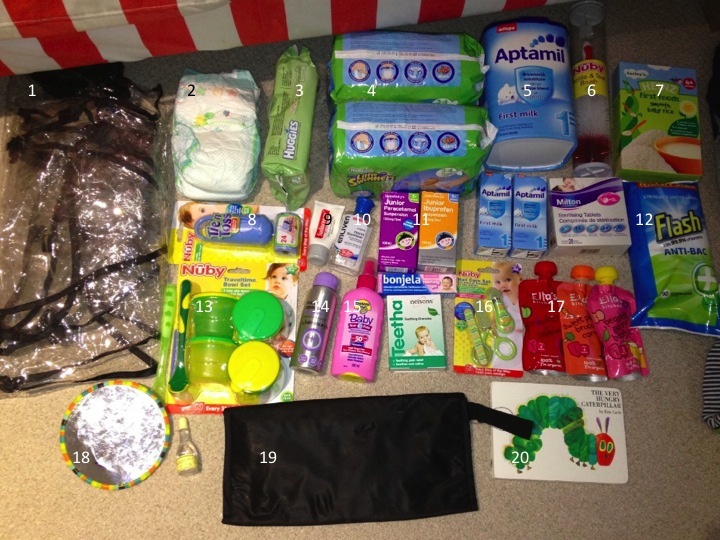 Nappies – I only took enough nappies for the first few days and bought some out there. I wish I’d brought more as the ones were bought there were truly awful. 2 packs swimming nappies – this was 1 pack too many! I thought he would be in swimmers all day but really Reuben used 1 or, occasionally 2, per day. 1 box of formula and 2 cartons of ready made milk – Reuben is now exclusively using formula and this amount of milk was exactly right, we came home with a wee bit of formula left. My theory was that if we ran out we could buy more there. Some people advise to make sure you have enough in case you can’t find your brand and baby turns his nose up to what ever you offer him out there! Baby rice – I only used this once and then it exploded all over our luggage on the way home. 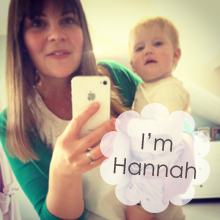 I just wouldn’t bother (unless your baby has just started weaning!) Reuben just ate what we did. Nappy bags – I normally have one of those super cheap Asda nappy bag packs that end up distributed all over the inside of Reuben’s changing bag, so this Toss and Tie Nappy Bag dispenser that Nuby sent me just before we left was a neat-freak’s god send! Baby Paracetamol, Ibuprofen, bonjela and teething granules – in case for some miraculous reason Reuben finally starts to get teeth! We didn’t need any of it but obviously wouldn’t have travelled without it. Baby food holders and spoon – they are great for storing little bits of fruit for snacks; however, because of the abundance of food (all inclusive and don’t my hips know it!) we didn’t use them as food holders much. They actually came in handy as something for Reuben to play with, especially when we sat him in water in his little dingy! Insect repellent – we didn’t need it but could have done. Be sure to check it’s suitable for your baby’s age! Nail clippers – so glad we had these, Reuben’s nails seemed to grow even quicker out there! 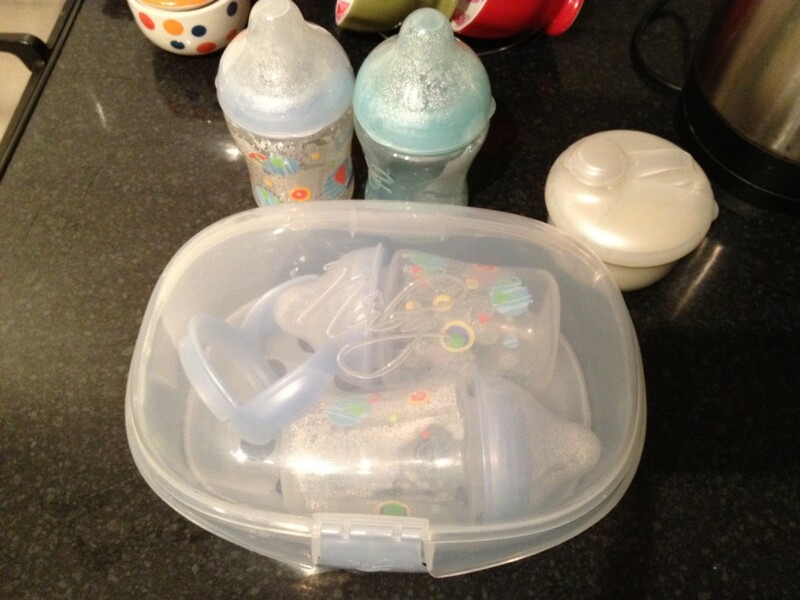 Baby food – just in case! Handy for the plane out and on the way back. Although we had 3 I only used the third when we got back home and the cupboards were bare. Some toys – I’ve only pictured a mirror and some bubbles here but we took a whole bunch of toys in his hand luggage. Some books – on the way back for the last half an hour, his animal sounds book that we got free from Bookstart was the only thing I could keep him entertained with. He LOVES the cat. (see picture below) 4 bottles – we were going to only take 3 but I’m glad we didn’t, it just made it easier to have an extra one on hand so you didn’t have to keep running back to the room to clean and sterilise bottles and boil the kettle. Milk dispenser – nobody goes anywhere without one! Travel steriliser – we had a microwave, however, I wasn’t sure if we would. I wanted to take this anyway so we would have something to use the steriliser tablets in (see point 6). 24. Entertainment – and finally…Baby Einstein’s – Baby Beethoven. I meant to also bring some songs on my phone or ipad for him but never got round to it. Fortunately (but not for the plane passengers), I had them in my head. Heh heh. And, of course, don’t forget to get your baby’s passport well in advance and any relevant travel insurance. I found that we pretty much had everything we needed, except perhaps more comfy little trousers or shorts (he spent probably too much time in just a vest! ), and I was confident that if we didn’t have it we’d be able to buy it out there. You may not be as confident or relaxed about travelling as me though, so I’m sure there’s a whole bunch of things a more careful traveller would have taken too. Other things you might want to make sure you have when travelling with baby are baby’s favourite toy, music or programme. Also you could consider taking blackout blinds and a breathable cover for the buggy…Reuben struggled to sleep outside in his buggy during the day – too much going on! I hope that’s useful…what have I missed?! Please do let me know in the comment section below. Thanks 4 the info! We are taking our 8 month old lily to italynext week and Ive been mentally packing for weeks!! In addition to the stuff u mention we are taking a baby backpack carrier!! Off to buy a v big case!! Glad I could help, Rebecca!! Yes, because ours was an all inclusive slob out holiday by the pool (I’m unashamed to say I only left the hotel once!) we didn’t need a baby carrier, but if you’re off hiking (hey, we’re all different!) then you certainly will 😉 I’d also recommend taking one for city breaks, they’re really useful for being a bit more streamline in the crowds! Hi Hannah. I’m going to Spain next week with my son who will be 7 months and this is fantastic help! I’m a bit worried about food for him though. Was it easy to feeding your son when you were out there? I’m sure breakfast will be fine (he can eat toast and scrambled egg etc) but not sure about his other meals. Any advice you could give would be great. Hi Lianne, you are sooooo lucky – I want to be going to Spain next week!! Like you say breakfast is fine, scrambled eggs, fruit etc is all fine. Later in the day I would grab some veg (nearly always boiled within an inch of its life, so easy to mash!) and mix it with some of the pasta sauce, etc. I had to kind of ignore salt content for that week though which I wasn’t too pleased about. If I could do it again, I think I would go see the chef and ask if he could do a few different things…maybe? I’m a bit of a chicken! What you could do is save things you like from breakfast and store them in your fridge for lunch? Definitely store fruit, I’d always have an orange (that I’d peel and then de-skin for my little emperor!) or kiwi in my bag for little snacks. I hope that helps. Do let me know how you get on (or if you get some more useful advice from elsewhere!!). Hi, we are taking our 5 month old to Greece next week and I was wondering where you got the sudocrem in a tube and also the travel sterilizing container? Thanks! Love the checklist. I’m more of a plan three months in advance what to pack kind of tourist. Quick question, how did you bring milk for baby back through las palmas? I’ve planned to pick up milk at boots in Manchester airport on way. But not sure what customs will be like on way back. Do I take powder and water or can I take pre made cartons? Hi Natalie, thanks for your question – we are so very different 😉 I normally find this stuff out at the airport! We took water and powder to make up bottles as we needed them. They might make you taste the water to be sure. We recently went to Egypt and took cows milk now Reuben is 17 months – again they made me try it but there was no big issue. I have a feeling that cartons would be OK BUT I don’t know for sure – it would be awful if they made you open them to try them!! so perhaps stick to powder to be on the safe side? Oh wow! I am much more of a minimalist and only take the basics when we travel. With three boys, the clothes will definitely get dirty and we just don’t have the luggage allowance to take everything we’d really need. Funnily enough I have to pack today for the weekend away. Oh you need so much stuff to travel with kids don’t you! It’s ridiculous! I always completely overpack, but then forget something crucial! I just don’t have the time to be as organised as I used to be. 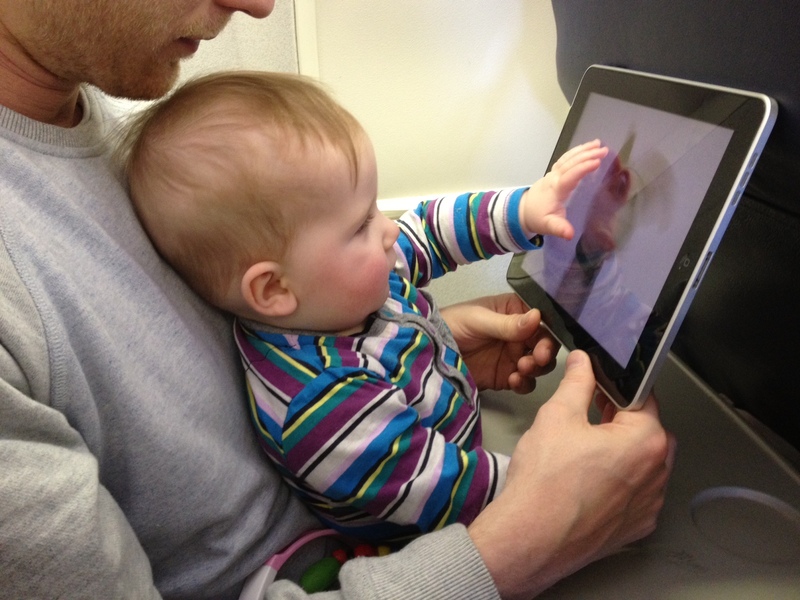 That and the thought of coping on a 7 hour flight with a 12 month old is filling me with dread! Wow that’s quite a list! Glad I don’t have to lug all that with me on holidays anymore ! I couldn’t see after sun. The kind of thing you hope you don’t need but is good to have. And sunglasses or visors. Eyes need protection from the sun. There is no such thing as travelling light with children! Have a lovely time! I wish I could say that we were taking Lily away soon butttt we’re not, there’s just too much going on at the moment. We’re hoping to move very soon and when we’re settled, a trip to the Travel Agents will definitely be in order to see what’s on offer. I’ll definitely come back and re-visit this post for some packing inspiration/reassurance! Thank you for sharing! Just come across your list and I’m going away on Monday with my baby boy who turns 8 months the day after we travel. I’m still writing my list so yours is really helpful and has great detail. 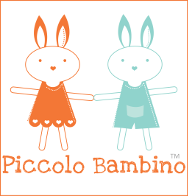 Thank you so much for taking the time to write such a great blog. Your list is amazing! I will definately be checking off each of them, we go to grab canaria in May, I was just wandering how you got on with security taking bottles through? I’m in panic mode of what I’m allowed to take? Hey Jodie, ooh! How exciting 😀 We didn’t have any problem getting through security – I think I took a couple of his normal bottles through (boiled water with the power in those little pots) and they just asked me to drink some…maybe?! My memory is hazy!! But worse comes to worse you can always buy some cartons from boots once you’re through security! Do you take baby vest style wet suits (the body warmer Velcro on type you put them in for cold public swimming pools over here) for your little ones on hols or just the cover up from UV baby swimwear on top of a happy / swim nappy? Not sure whether they need the extra warmth that they get from the wet suit, or just to be kept out of the sun. My little man is 7 months old and loves swimming, but I’m not sure if he’ll find it too cold in the water when we’re not in a nice warm baby pool. We’re going to Tenerife and it’s expected to be 24 – 27 degrees, so nice and warm – but not sure the pool will be heated. I’ve been looking through a lot of baby travel essential lists at the moment – I think it’s because I’m imagining some lovely holidays that are nowhere near happening at the moment. This might be the most detailed, though. Thanks.